ComeoutsidewithSprout – Page 3 – Jack Russell, Gardener, oddness, be nice. I hope I know you well enough be honest with you, I haven’t really been in the correct frame of mind to write for you recently, I start writing and then “stuff” comes into my head, you know, the daily the niggles, the things that have been said that shouldn’t have been – by other people of course, not me. And that’s a bit daft really, because, and please forgive my honesty, I don’t really write for you, I write for me; to get something off my chest or just to rattle on until I come to a point where I haven’t got anything left to say. So I asked someone for some inspiration for this next Blog and we shall call her The Pilates Pixie and do you know what, her idea was brilliant and inspiring and thought provoking so I’ll pretend it was mine. It’s something we all do, all of the time, but don’t realise we are doing it and when we realise we are doing it, it’s impossible to do it any more. It’s not rubbing your tummy whilst patting your head whilst licking your own nose with one elbow touching the ground. But try it anyway, I can do it, because I am very good at Pilates – (I can’t and I’m not, but I give it a go). And the Pilates Pixie is right when she says that meditation is the state of mind you reach when you are doing a repetitive job that you are completely confident about and it allows your mind to drift and think about what might have been and which fantasy career you might have had, well that’s our interpretation of it. So I started thinking, what fantasy job do I think about when I am engrossed in a job like mowing or weeding or putting up the framework for next year’s climbing beans. I’m surrounded by people who appreciate what I do. Some of them even bring coffee and cake. (Going off on a tangent here, you can’t imagine how happy you make a gardener when you make them a cup of tea or coffee and bring them a piece of cake when the wind, rain and sometimes snow are coming at them horizontally). What I don’t get done today, can be done tomorrow. I can take my dog to work. Yeah, I guess I’m happy. I’m not a stained glass window maker, but I can see the attraction. Although my favourite stained glass window is in the church of St Martin in the Fields, which isn’t stained, but it is beautiful – have a look. Last time I was there I stood looking at the window listening to a Christian service being taken in Cantonese, it made no sense. But happiness doesn’t need to make sense. Neither am I a horse trainer for cowboys for films, or a cowboy trainer for horses for films, but I can see the attraction, but not in a Brokeback Mountain kind of way. But if it makes you happy, go for it. I think I would have been a pretty good cowboy if I had wanted to. But if those happen to be your fantasy jobs, you may not get to do them, but bear this in mind, every time I look at a cowboy film or a stained glass window I will think of you, and your insight, and your humour and the fact that you keep the Dancing Queen occupied for a couple of hours a week to let me recharge my batteries. So thank you. Another part of my fantasy job would to be a writer, an author, a storyteller, a wordsmith. But I don’t reckon I’d have an audience. So I’ll just carry on doing these therapy sessions that just happen to involve writing. Until next time, happy fantasies. And if anyone could fantasise about getting rid of this horrible winter weather, I’d be most grateful. And HAPPY. And if you need some help learning to meditate, I know a really good teacher. We all do it, don’t we. No, not that, not everyone does that. Hopefully. We all judge a book by it’s cover. It’s probably one of the first things we are taught. That and how to use a potty and how to read. Reading a book or looking at your phone whilst on a toilet should be a no-no automatically from thereon in. Book, cover, don’t judge, yes, that’s where we were. The Dancing Queen and I went off for one of our jaunts this weekend. We couldn’t decide where to go and couldn’t face the drive to Cornwall or The Lakes, so we put a pin in a map and headed off towards Trinidad, fortunately I checked the travel time and we headed to Camber Sands instead. I’d never been to Camber Sands before and The Dancing Queen has always wanted to go there, so I researched and found there is one hotel there – The Gallivant. They are having a refit at present so they upgraded us to a suite when I booked the room. I was a touch disappointed when we arrived to find half the front boarded up and loads of builders knocking about. So I judged the place by half it’s cover and suggested we turn round and go home. The Dancing Queen advised me that she liked the smell of planed wood – it’s good that we can still discover new things about each other, even after 14 years together- and so we went into reception to be met by a lovely lady called Hannah who was probably one of the best Hotel Managers we have met, very professional and smiley and told us cake and tea would be served shortly, so go and settle into your room. She had me at cake. After tea and cake (lots) we went for a pre-dinner walk on the beach to catch the sunset. A hop skip and jump found us coming to the brow of the sand dunes and boom, I was transported back 40 years. Camber Sands has sand dunes, it has a huge beach, it has horses cantering along the sand. It was just like Ainsdale Beach near Southport where we used to go to when visiting our Grandparents. The only thing different was that there wasn’t a 10 year old me. Being taught to drive. In a mini. On the sand. With the only instruction being “not to hit Southport Pier”. Times change. The Dancing Queen and a sunset. We went back to the hotel after watching a lovely sunset and prepared for dinner. I had pigeon, followed by short rib of beef, followed by ginger sponge. Yes, I’m, sticking to my vegetarian diet. At home. We spent the following day in Rye and ate cake and then lunch and walked the 3 miles back to the hotel to prepare ourselves for more pre-dinner cake and a stroll on the beach. Dinner was pork croquette followed by lamb followed by custard tart and rhubarb which were just as fabulous as the night before offerings. “The Dancing Queen is vegetarian, but don’t hold that against her and I’m greedy”. And when The Dancing Queen left the table at the end of the meal she told the Restaurant Manager not to catch my eye as I was bound to ask for another meal to be delivered to the table. Anyhow, back to the Gallivant, go to The Gallivant, don’t worry what it looks like on the outside, after all you’re looking out. I think it will become rather popular. Don’t judge anything by what it looks like, apart from me. I really am a glutton, and have started keeping wood shavings behind my ears. Those who hear their dog’s voices, and those who lie. I’m convinced that, if it wasn’t for Sprout quietly whispering in my ear throughout the day, my somewhat tenuous grip with reality would slacken and I would be cast into a dark place. I was lucky to be born into a family of dog lovers, the first dog I was acquainted with was Jamba, a Rhodesian Ridgeback who arrived in a crate at Ashford station a couple of weeks after I was born, or it might have been the other way round, I’ve never stopped to think about it, best I don’t. There’s a photo of me and Jamba in his dog basket, one of us has a wet nose and big ears, and the other is a dog. He was huge, he didn’t really like adults, but loved children and was at his happiest when he had his head up the chimney when the fire was lit, I’m not sure if it was the heat he liked or it was just an oddness he had. Mark and Jamba, you decide which is which. When he had taken us as far as he could, we came under the watchful eye of Beaumont, what a grand name that was for a dog. I wanted to call him Botham, but when that was vetoed, Beaumont was approved as he was the other captain on a Question of Sport. The host was David Coleman, in the days before Sue Barker, which might also have been a good name for a dog. Barker, not Sue. I recall that my Mum and youngest sister went shopping one day to get a dress for a wedding and came back from Brighton with a Golden Retriever. He even had a role to play at my other Sister’s wedding when he was a page boy. Beaumont in focus, as it should be. There were a few years when I was without dog, this, on reflection was wrong. Me: “Best we get a dog then”. So we got Mungo, or to give him his full name, Mungo Mickey Rachel Podcast Procter the third. He was supposed to come out gardening with me, but he much preferred The Dancing Queen’s company ((Editor: who doesn’t) as if anyone edits this….) so he became her constant companion, running in the woods, walks in the park, comfort when the days were dark and joy all the time in between. As darling Mungo’s energies waned, he decreed that his responsibilities would be best if they were shared. Sprout entered our lives, like Mungo he was a rescue dog, his full name is Sprout Skip Liam Peaky Blinder Eff Off Procter the First, yes he’s a Jack Russell, everyone said don’t get a J.R, they’re full off urine and vinegar, but loyal. He is certainly loyal, and he certainly knows his own mind and seems to arbitrarily decide whether he likes another dog or not and he gets me through the dark and wet days of Winter at work. You notice I haven’t used the word “owner” once in this blog. Although cat people say dogs have owners and cats have staff, dog people know that they are owned by their dogs. This blog was supposed to be a Valentine’s Day special in which I talked about the importance of love in my life and how finding that one special person to share my life with had made everything make sense. Sorry, I’ve got to go, Sprout is demanding I rescue him from the sofa he isn’t supposed to go on. 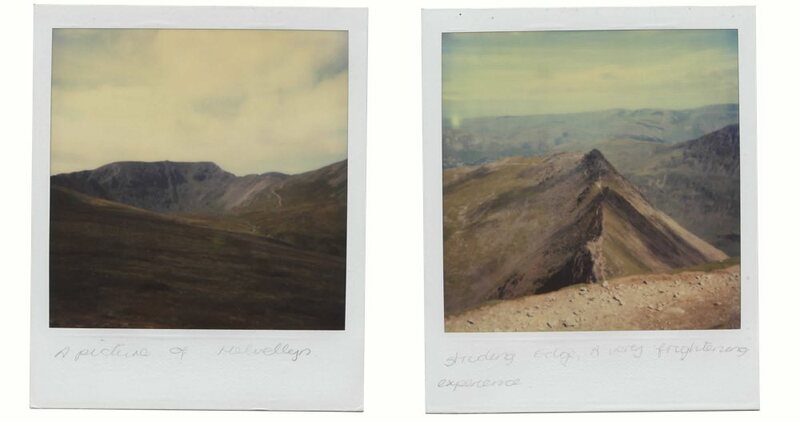 My favourite walk – Helvellyn. To celebrate this week’s brilliant 100 favourite walks on ITV, I’m regurgitating this blog from The Outdoor Guide website to celebrate the glorious Helvellyn winning. And not because I haven’t written an original blog this weekend because the rugby is on. Not because of that at all. I did take Sprout out for a walk and he got muddy. My favourite walk is and was also my scariest walk. Let me explain. 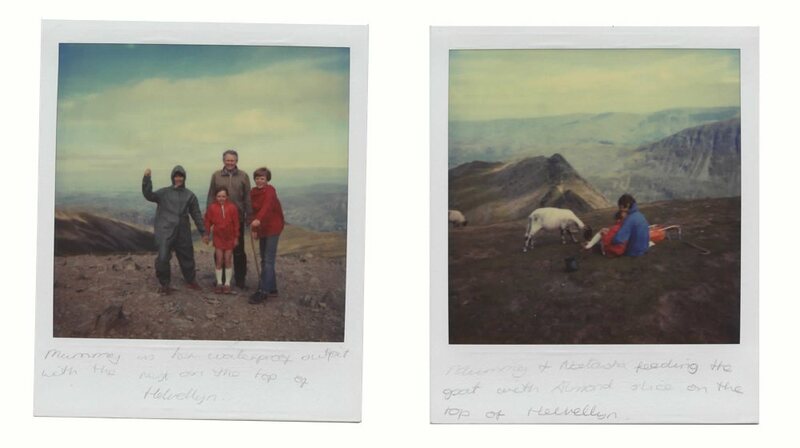 In 1981 my Mum, Dad, my two sisters and myself went to The Lake District for our Summer holiday from the South Coast. We stayed in student accommodation at Lancaster University with our extended family and friends and used it as a base to explore The Lakes, where Mum and Dad spent a lot of time in their youth from their homes in Southport. I think Mum decreed that we should climb Helvellyn via Striding Edge, guided by Wainwright. Being 14, 12 & 9, we kids knew no better than to trust what our parents said. I have few recollections of the day, other than picnics, Striding Edge, a final scramble up the scree to the summit where, Dad said “you go ahead Mark, I’ll make sure the girls are ok”. I think he had seen the fear in my eyes and urged me on. We had a picnic at the top including almond slices. Other highlights of the holiday were watching my 5 & 7 year old cousins, adrift, in a dinghy, on Lake Coniston taking lumps out each other with their oars. I didn’t know what to do, but saw my father crying with laughter. So joined in. Another highlight was dancing the can can with the family to Bad Manners at the weekly disco. All fairly humdrum and just another family holiday. Well, it was, and it wasn’t. The following Summer, Dad died of a heart attack aged 45. So, it was our last family holiday, but the memories I have of it are of halcyon days, I don’t think it even rained that week!! I was 50 last year, Tanya 50 this year as well as Mum being 80. I go back to The Lakes every year. We tease Mum relentlessly about taking such ill prepared and young children up Striding Edge. We were blessed to have such a wonderful Dad for a short time, who helped us appreciate nature and humour. And a Mum who has been our rock. I have included some photographs, you will notice Mum dressed extremely sensibly and my youngest sister, Natasha, in what appears to be shorts and sandals, it is well known within the family that to get Natasha to wear anything other than a bikini during the summer was a battle of wills!! It still is, but she won’t thank me for saying that, or sharing the photo’s…. No one was as surprised as me when I decided to go to Plumpton College and train to be a gardener. I was 36, I had always worked in banks or offices and the closest I had been to the soil was when I used to throw myself around in mud under the pretence of being a goalkeeper. But to be a gardener was what I was going to do. On reflection though, I suppose, at some stage I was always going to garden, either for myself or for other people, it was in my blood. I don’t mean my Great Grandfather mowed the lawns at Blenheim Palace or anything like that, but I think it comes from my Grandma. Grandma lived in Southport, she worked in a bakery (perhaps I was predetermined to love cake too.) and made the most fabulous vanilla slices and parkin, but it’s the smells that are the most evocative, a roasting chicken with sage and onion stuffing cooking takes me back to her kitchen, as does the smell of the tea in her wall mounted leaf tea dispenser. The smell of the yellow roses in her garden, which, in my memory were always in flower, no matter when we went to see her, lives on too. Even today a yellow rose is my favourite and I’m sure many of my customers have seen me stop to smell their roses. I came across a yellow rose, in Sussex, in January, in flower this week. It’s probably fitting that a yellow rose signifies friendship and joy. But it’s the soil, the smell of the soil that I best remember, which sounds a bit odd written down I know. Judge me if you like, as I said to The Dancing Queen the other day “You do know I’m a bit odd don’t you”, she hasn’t responded yet, perhaps she’s waiting to break it to me that I’m the most normal person she knows. But, perhaps not. Where was I, The sandy, peaty soil in Grandma’s garden was black and fertile and pungent and sometimes, just sometimes, I get a whiff of that scent down in Sussex’s chalk and clay soil which is clever to say the least. I daresay one or two customers have seen me sniff a handful of soil. I’m not sure what that signifies. Which leads me on to a couple of weeks ago when I was in a lovely customer’s garden, it was cold, it had been wet and I was trying to light a fire. But, because it was cold and had been wet, my hands couldn’t determine if the kindling was dry, so I lightly brushed the kindling against my cheek to check on it’s dryness. It was then that two things happened, firstly I discovered that dried nettles still carry a sting and secondly my customer came out with a cup of tea. Jon claims he didn’t see her coming to the bonfire, as does Sprout and Mrs G, in her usual polite way asked if “I was quite alright” as she backed away, rapidly, laughing. I did get the fire going though. Back to Grandma’s garden, she had old, gnarled apple trees, she had perfectly manicured lawns and she had a compost bay at the back of the garden which backed on to a builder’s yard with all the lovely smelly diesel lorries, in the days when we didn’t know it was wrong to like smelly diesel lorries. I also remember that Grandma had the best garden, the tidiest garden, the best smelling garden and it wasn’t just the soil that made it so, it was the hours of hard work she put in and the skill she had. I never got to tell her that my love of gardening comes from her and my Mum and, even if I had, I’m not sure what she would have said. Grandma was from that stock where effusiveness wasn’t part of her make-up. Heaven knows what she would make of her Grandson writing about feelings. She would probably think I was a little bit odd. “There’s no such thing as bad weather, just bad equipment”. Well, until such time as I sign a deal with an outdoor clothing company, I beg to differ. The company that creates the first truly waterproof pair of workman’s boots will be praised to the roof tops or fell tops. Until then, I will have to rely on my Sealkskinz waterproof socks. (Shameless plug). Weather plays an important role in the life of outdoor folk, and we’re all outdoor folk really, whether we work outside all day, all year round, or choose to spend our leisure time outdoors; walking or gardening or dog walking, or, as an old customer once said to me, without a hint of irony, as I stood outside her kitchen door, dripping wet: “You won’t believe how wet I got going from my car to the supermarket this morning”. However, I think it’s on the bleakest days that I notice the light a bit more. Normally, after a day of near solid rain, a patch of blue sky (enough to make a Dutch boy a pair of trousers as my old Gran used to say) will appear at 3pm and the sun will have a go at warming and drying the place up and the day won’t have seemed so dreary. Especially if there has been a potting shed or glass house to tidy up; it’s amazing how conscientious a tidier-upper I can be when it’s raining outside. In the Winter, if there’s Sun at 3pm, then there will be a sunset at 4ish (As my old Gran never said, but it seems to be true, but don’t take my word for it, study the skies.) I understand the hopefulness of a sunrise and what it will bring to that day. But give me a sunset, the fireworks of red and pink and purple and gold and sheer “ta-dah” of a sunset, almost saying to the moon, “follow that, if you can” and the moon will follow, but it can’t compete, because it can’t compete, because it’s light is more melancholy, but just as necessary because it plays a supporting act to the flamboyant leading light . There are a couple of gardens I work in that have amongst the best sunsets, they are both near The South Downs with lots of trees silhouetted around. But nothing beats the sunsets of the South Coast, Cooden Beach or dear old Brighton are my favourites. Walking westwards along the prom, watching the sun dipping and almost fizzing into the sea as starlings swoop will always gladden my heart and which is why I want to retire to a beach, and spend my days phoning radio shows and my evenings throwing a ball for Sprout with The Dancing Queen next to me. Sprout, in the sea, at sunset..having “sprouted” horns. I do apologise, I drifted off for a moment there, I was supposed to be bemoaning the British weather and the travails of working in it all year round, but really, it’s not that bad, skin is waterproof and tomorrow’s another day and most customers bring out a cup of tea and we do have the beautiful British summers to look forward to…. Your correspondent finds himself in Las Vegas, attending a wedding and white water rafting through The Grand Canyon, not at the same time, with The Dancing Queen. If that wasn’t surreal enough I then received a phone call…. They were phoning on behalf of a production company who were filming an itv walking show with Julia Bradbury, and would I like to appear…. I left a polite pause of approximately 1 second and asked how much I would have to pay for this privilege.